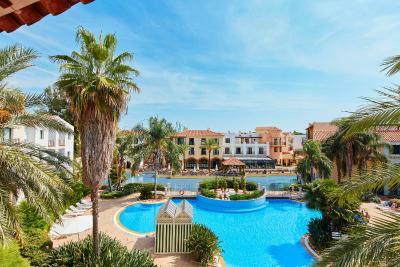 Lock in a great price for PortAventura® Hotel PortAventura - Includes PortAventura Park Tickets – rated 8 by recent guests! A special word of thanks to the security officer, positioned at the entrance to the park from Portaventura Hotel, who checked our personal belongings with his usual pleasant demeanor which does not put anyone off but had, in fact, warmed us to him! When I thanked him at the end of our stay, with a handshake, he took the trouble to shake both of my grandsons’ (10 & 12 years old) hands too, which said a lot about him! Amazing place. Kind staff. Great food. Many attractions. Proximity to Portaventura. Hotel facilities and areas around the pool nicely done and well maintained. Staff seemed profesional and friendly, but reception seem to lack certain basic information. Excellent variety of meals for breakfast. Entertaining, good value for vacation with kids. Park was amazing so much fun, pools and breakfast was good & friendly staff. Very nice location, if you came to visit the theme park. Helpful staff. The park has a lot of attractions and rides. One day is not enough, express speeds up things. It's perfect for family vacation. Really great breakfast, different choices, whether you like sweet or savoury meals for breakfast, you could find it! Convention centre is just 2 min walk away, which was great, as I attended a conference! 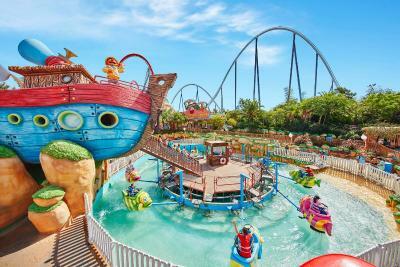 PortAventura® Hotel PortAventura - Includes PortAventura Park Tickets This rating is a reflection of how the property compares to the industry standard when it comes to price, facilities and services available. It's based on a self-evaluation by the property. Use this rating to help choose your stay! 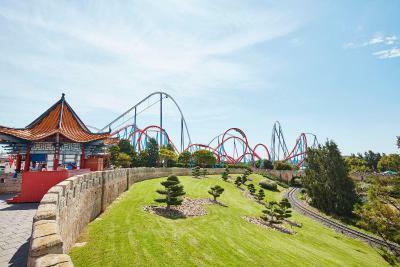 One of our top picks in Salou.Just 1-hour drive from the city of Barcelona, PortAventura® Hotel PortAventura offers guests free unlimited entry to the theme park and has direct access to the Mediterranean area. It features 2 outdoor swimming pools, accommodations with balconies and 4 restaurants. 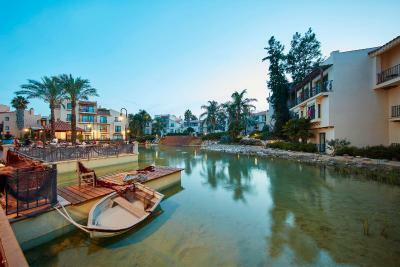 The hotel is a replica of a characteristic Mediterranean village with gardens and a lake. Its rooms have bright décor, satellite TV, a mini-bar and views of the hotel gardens or swimming pool. All rooms include free access to PortAventura Park for the total length of the stay, including both check-in and check-out dates. For a supplement, guests have access to the Hotel Caribe Wellness spa. This if free for some room types, where indicated. Services include a sauna, hot tub, steam baths, gym and heated indoor pool. The Port Regata restaurant serves à la carte options for breakfast. Mediterranean and buffet breakfast and cuisine are offered in the Buffet del Mar, Buffet del Port and La Cascada restaurants. The Cal Pep serves drinks and snacks by the pool. The hotel is a 5 minute-drive away from the beaches of Salou. 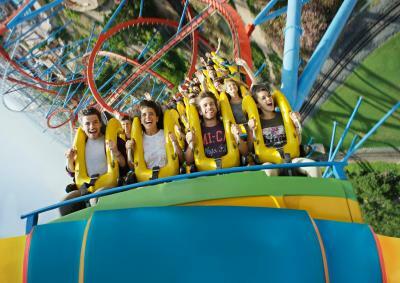 PortAventura is within 10 minutes' drive from Reus Airport, and AVE Station is about 20 minutes away by car. The city of Barcelona is 1 hour away by car, bus or train. 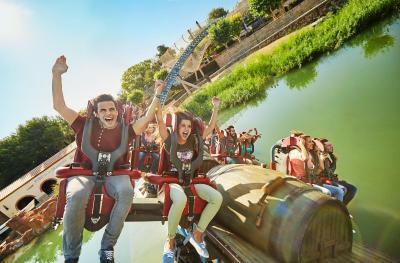 When would you like to stay at PortAventura® Hotel PortAventura - Includes PortAventura Park Tickets? This quadruple room features a mini-bar, satellite TV and air conditioning. 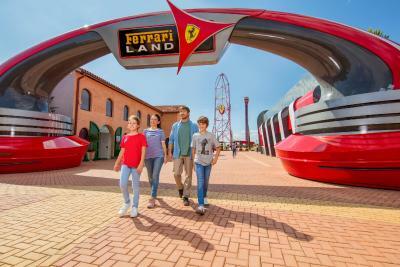 The room also includes 1 access to Ferrari Land as well as free and unlimited access to PortAventura® Park and discounts for the Costa Caribe waterpark (please check the parks' opening times). The access to the park covers the total length of the stay, with both check-in and check-out dates included. This quadruple room has a mini-bar, air conditioning and satellite TV. This quadruple room has a satellite TV, mini-bar and air conditioning. 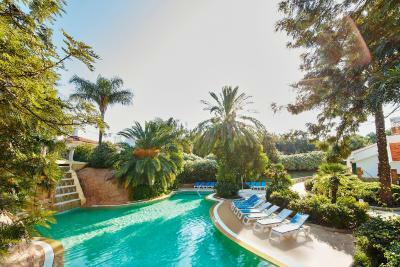 Our delightful 4-star hotel allows you to experience the Mediterranean’s magic at only 1-hour from Barcelona. 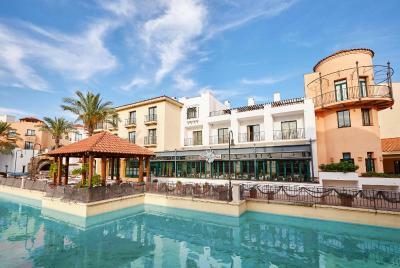 Recreating a typical fishing village, Hotel PortAventura offers 500 rooms, 2 pools, 2 buffets, an à la carte restaurant as well as shopping and sports facilities. The Plaza Mayor with its Mediterranean facades, the streets, the lake -where fishing boats gently rest- and the magnificent gardens allow you to enjoy a relaxing experience and also a fun adventure. 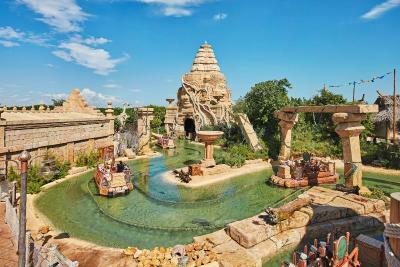 Guests have direct access to the Mediterrània area of the park as well as many other benefits. 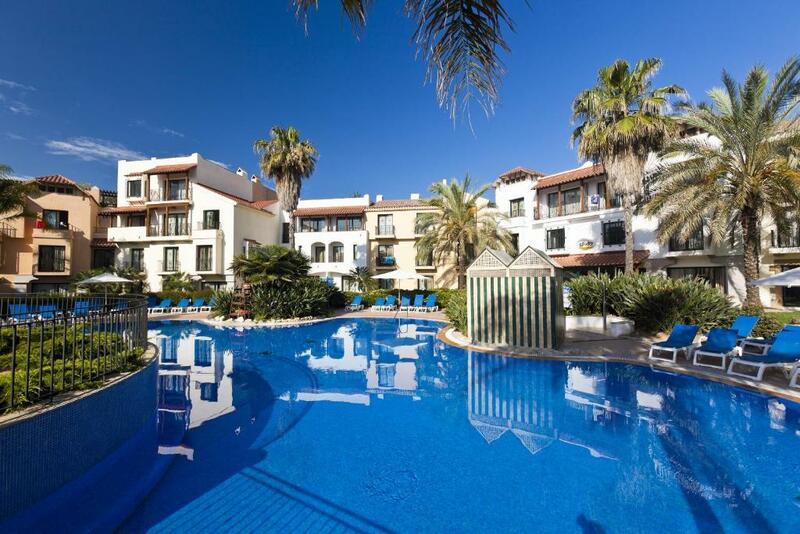 House Rules PortAventura® Hotel PortAventura - Includes PortAventura Park Tickets takes special requests – add in the next step! 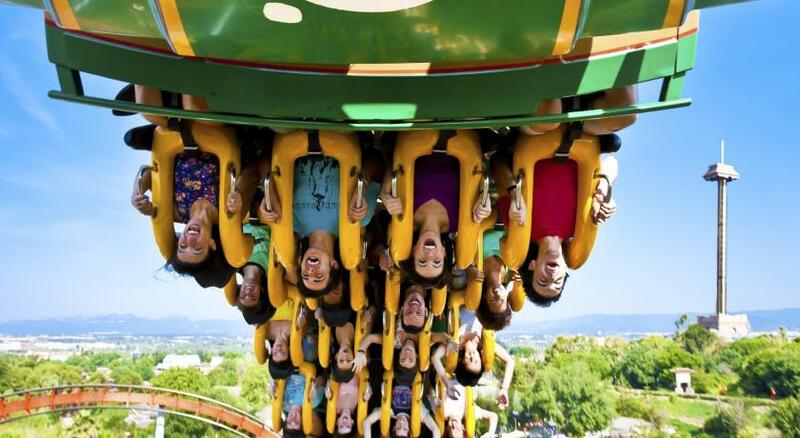 PortAventura® Hotel PortAventura - Includes PortAventura Park Tickets accepts these cards and reserves the right to temporarily hold an amount prior to arrival. The room also includes free and unlimited access to PortAventura® Park and discounts for the Costa Caribe waterpark (please check the parks' opening times). The access to the park covers the total length of the stay, including both check-in and check-out dates. Please inform PortAventura® Hotel PortAventura - Includes PortAventura Park Tickets of your expected arrival time in advance. You can use the Special Requests box when booking, or contact the property directly using the contact details in your confirmation. The facilities are a bit too dated, especially bathroom. We had a smell in the room, asked to change the room, the staff agreed, but the room was too far from the entrance so we did not bother, cause we stayed just one night. SPA center is very pure. Long queues for breakfast. No complimentary water bottles in the room. It worths if you've got a special offer and wish to save time for transportation to the parks. Bedrooms and hallways could do with an update a bit tired. Everything loved it! Staff friendly nothing too much trouble it was fantastic and such great value for money! Buffet breakfast and dinner was perfect huge choice amazing 5* waitress service we loved it so much going back next. Year same time with my older children too!! Our room stank! I thought that it was perhaps the Maid had used a dirty mop but the smell never went away. So I asked if we could change room and we moved to an upstairs room. It stank too, but then I was able to open the window to reduce the stink. Honestly the smell was bad and is clearly drains or dampness because it was pervasive. The receptionist helped us, but I didn't get the sense she was happy about it, and I wasn't rude or anything. I would never do that. The ease to get in and out of the theme park, and the fact that the tickets to enter both parks are included in the price makes this an absolute bargain. You also don't need to go through the bag searches every time you go into the theme park, and you save the 14 euro a day parking fee. They have kids themed events like a little show and face painting. The pool was closed when we were there which annoyed my children. Mostly everything else. Tap water was pool-like water, awful. Facilities were old and not properly maintained. The room “welcomed” us when we tried to open the bathroom door and the handle just came out. The cleaning staff made the beds clearly in a very quick manner, not lining the bed sheets properly. No place to buy food or water only by paying a lot at restaurants and cafes or kiosks with junk food with absolutely no vegan option, my wife suffered badly because of this. Value for money, let’s say we were happy to be back home in Austria, that tells a lot. Especially with little kids, not a recommended place to stay at all. The staff. Very helpful and customer-focused at the hotel and at the park. Location of the hotel and access to the park, very good and centric. 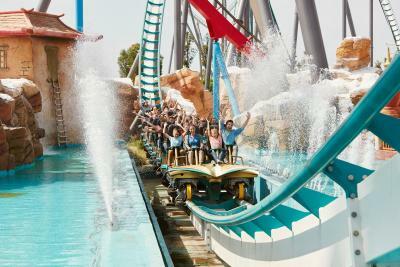 Without Port Aventura, here is nothing good! 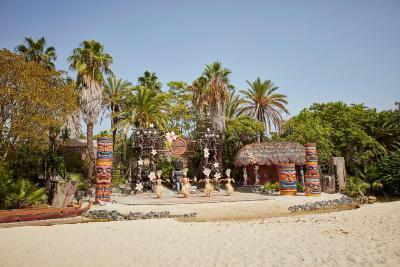 Just next to Port Aventura, otherwise should not have person choose to live there! In room, doesn’t have anything for clients, even totally empty in mini bar!!!!!!! No any bottles of water, if you want order, sorry, you need to go there restaurant to buy yourself, because they don’t provide this room service!!!!!!! I don’t understand how they get 4 stars, even all the furniture or sth in bath room totally broken already! !! The food in restaurant is one of the worst food I had in my life, I feel all the food just from Congelador directly put to microwave!!!! But it is expensive! Anyway I will never live there again. That’s it! The Customer Services lady could have been more helpful, more forthcoming & accurate in providing information. It took quite an effort on my part to have my query & request for help answered, not by this lady who is at the desk for such purpose, instead, I had to seek help from one of the receptionists at the reception desk who managed to help set my mind at ease! What was made worse was the earlier info provided by that same customer service lady was inaccurate, having caused unnecessary anxiety! There is a door inside each of rooms which leads to a neighbor room. There were another guests in that room and it felt like they just talk inside our apartment. I understand that the solution is good for big families which can book two rooms and make a suit from them, but in our case that was the biggest disappointment. May be additional silicone isolation will be a solution. There was no also dedicated shampoo ( the soap they have is not very good for hair ) - so take yours. We were offered with a two towels staying three of us which was also strange. We shared a towel with my wife to give one for a kid.